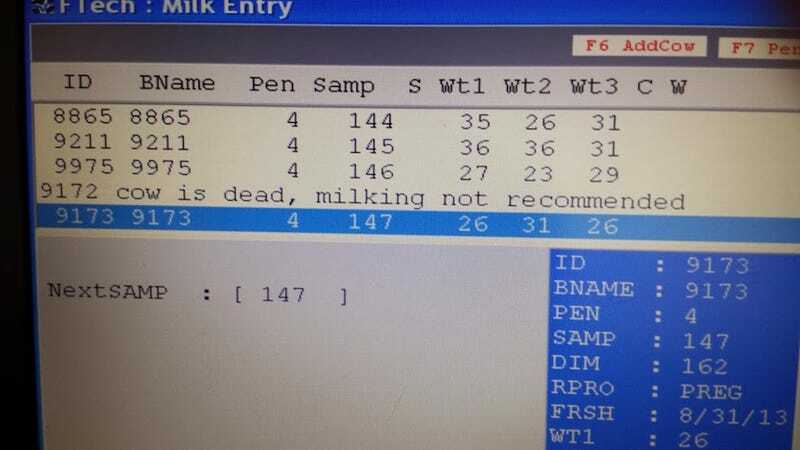 "Cow is dead, milking not recommended." Today I was at one of the biggest dairy farms in Minnesota. They milk almost 2,000 cows. The average dairy in Minnesota is somewhere around 110 cows (it grows every year), but in western and southwestern states several thousand cows is the norm. They have a cool setup called a "rotary parlor" — the employees stand still, and the cows ride a carousel around them. Only the very biggest farms can afford rotary parlors. Like most dairy farms, each cow is milked 3 times a day, and it takes about five minutes each time. The other 23+ hours she gets to spend eating, sleeping and just hanging out. This keeps the parlor going pretty much 24/7 - they stop to wash three times a day. The make over 17,000 gallons of milk every day. My job is to take a milk sample from each cow, which we test on several different quality measures, and for fat and protein levels. This helps them measure their progress as a farm, and it helps them determine which cows are better and which cows are worse. The more fat and protein in the milk, the more we get paid for it.